Debbie Roberts has overdosed seven times, she is HIV-positive and she lost her eyesight in 2012 after doing crystal meth. On Tuesday, she shared her story at an event held by AIDS Saskatoon, part of the National Day of Action on the Overdose Crisis. The day of action is organized by the Canadian Association of People Who Use Drugs. Now, she works in the community to help those who are dealing with addiction and HIV. According to AIDS Saskatoon, more than 10,000 Canadians have died from accidental opioid overdoses in less than three years. In 2018, Saskatchewan had 78 confirmed overdose deaths. Roberts said the issue affects everyone. Lauryn Kronick, an education and prevention coordinator at AIDS Saskatoon, said people in the city who use drugs face stigma. Roberts uses a form of art therapy – body mapping – to deal with trauma. While she is able to tell her story, she wishes her husband could do the same. He died of an overdose last year. Roberts said it isn’t too late for others. 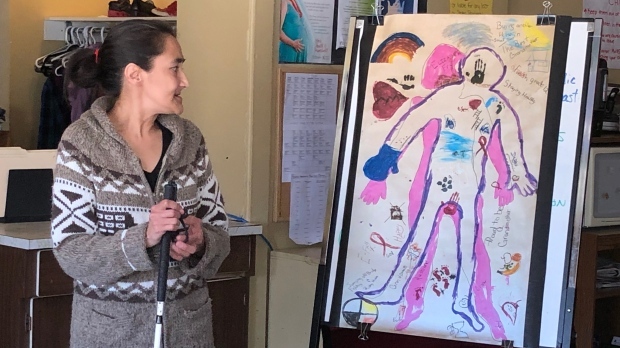 Roberts and AIDS Saskatoon hope to hold an event like this every year to give drug users and their family members a safe space to share their stories.